Cashew drink with added calcium and vitamins. Creamy taste. Low in sugars. +Calcium & vit. B2, B12, D. 100% plant-based. Naturally low in fat. Easy to digest as naturally lactose free. Free from dairy and gluten. Free from colours and flavours. 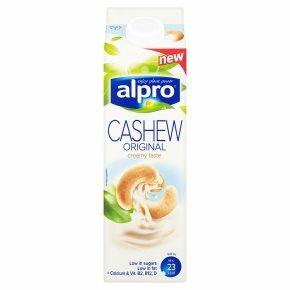 Suitable for vegans.Enjoy the creaminess of Cashews! Discover the creaminess of cashews, with their subtle and smooth nutty taste! Enjoy a glass of Alpro®Cashew drink or whizz up into a delicious smoothie!